The Study: why do it? The Study is a self-motivated project, self-funded from a small pension. When I sit in my study and ponder the choices I have, I do tend to need some rationale for it. I concluded one of my earlier podcasts (No. 7) with some notes on why I undertook the project. Revisiting this subject has been catalysed by a visit to Shanghai Expo 2010. After a spectacular trip up the Huangpu River through the middle of the massive Shanghai-Pudong metropolis and its sometimes mind-boggling architecture, my wife and I entered the wide grounds of the expo and made a bee-line to the Australia Pavilion. I was keen to see how Australia presented itself to the world. My disappointment was profound. Just after returning home there was publicity in the media about an international survey that demonstrated Australia was perceived as 'the dumb blonde of the world'. What I saw at the expo I believe would have reinforced that perception with an almost perverse deliberateness. 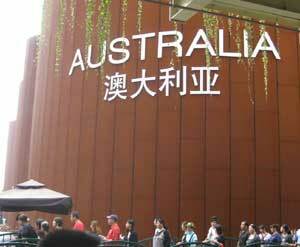 To me the Australian pavilion was pretty much just a crowd wrapped in a tourist brochure for Sydney. The rusty-coloured building certainly stood out memorably among scores of others that were often quite forgettable. It was popular too. Long queues were directed through it along lines of barriers and mist-cooled paths with admirable efficiency. Once inside the momentum continued until everyone was funnelled into a one-thousand-seat theatre-in-the-round. There was virtually no time or space to look at the displays and read the screeds on the walls that endeavoured to give some overview of Australia's history, geography and culture. It didn't matter because we were all there for the centre piece of the pavilion, a cartoon show. The crowd poured in and sat contemplating a stage set of sandcastles and beach toys. The show started when a clever array of screens popped up from the floor in the middle of the theatre. The screens revolved in a circle around the sandcastles so everyone could see the cartoon. It featured the adventures of three children: a blonde beach boy, a vaguely Asian and clearly liberated girl and an androgenous little aborigine. The boy's highest ambition appeared to be to grow up into a rock star. The other two kept telling us they could be whatever they wanted to be without really saying anything. It was all politically correct as one would expect, but the characters came across as airheads; shallow, pleasure-seeking, devoid of any inner life, classic examples of the lights all on and no-one home. Of course, being Australians there was no doubt they were nice people. But interesting? Intelligent, creative, dedicated? Hardly. We don't know what the Chinese audience made of this; without a reasonable level of English the dialogue was irrelevant anyway. The rapid fire split-second images of flocks of sheep, verdant crops, mines, even a few of industry, all interwoven with beach life and lots of shots of Sydney, did not seem to leave much impression. The overwhelming message both in the cartoon and the pavilion as a whole was that the heart and mind of Australia is on Bondi Beach. 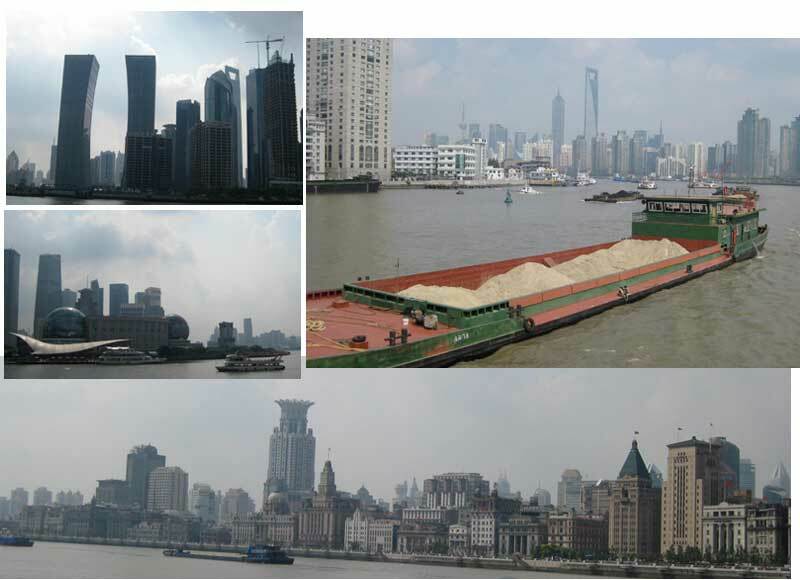 (Above) Scenes along the Huangpu River, Shanghai, October, 2010: (top left) new buildings in Pudong; (middle) a panorama of the Bund. The river was swarming with barges carrying building supplies; (top right) the big one carrying sand is probably headed for the Australia Pavilion (left) where visitors might be treated to advanced Australian technology and architecture illustrated by building sandcastles. If there was any sense of 'taking the piss' out of the near megalomania of the host city one could be more appreciative; alas, the culture that produced the Australian exhibits really expects the world to love us for our sandcastles. The opening ceremony of the Sydney Olympics 2000 was celebrated as a great pageant of Australian life and rightly so in many ways. Its representation of indigenous and other aspects of our culture was laudable. But maybe I took a toilet break at the wrong moment. I didn't see any representation of our intellectual life. Amongst all the Blundstone boots and Victa mowers, where were the scientists, the writers, the artists? There was a reference to Sidney Nolan's Ned Kelly paintings; a brief appearance by Yvonne Kenny was all we got for high culture. The closing ceremony was similar. It reached a high point when three people were wheeled out on big white pedestals; three whose fame derived from the world of entertainment and leisure. Depending on how you define an Australian we had won up to eight Nobel Prizes by 2000. All but one (Patrick White) were in science, mostly biomedical science, an area where we are told we punch above our weight. One of them - Peter Doherty - had won as recently as 1996. No pedestal for him. It reflects an anti-intellectual streak that runs deep in Australian life. I think it's supposed to be part of our larrikin character. I also think it is a failure of character ; it holds us back with regrettable consequences. We don't value education enough; we especially don't value research enough; we don't value creative intellectual endeavour generally enough. This undervaluation is re-inforced by a strange confluence of attitudes between the supposed economic rationalist bean counters and post-modernist culture. Shelley Gare, a Sydney author discusses this in a recent book The Triumph of the Airheads: and the retreat from commonsense (Park Street Press, Double Bay, NSW, 2006). The bean counters insist on cutting funds from anything that doesn't attract a big enough market. For universities it has been not just philosophy and physics, nor even science in general, music and languages, but the university as an institutional ideal itself that has suffered. The pervasive post-modernist culture certainly doesn't care, being disdainful of all that, suspicious of anything it thinks might be 'elitist'. It is no wonder that for so many years our universities suffered such poor government support, our school libraries were run down. But there lies the strength of the anti-intellectualism; the cut-backs happened at the very time the universities were proving their strength in the global education market. For at least several years now the sector has joined mining and agriculture in the top handful of export earners. Any agricultural sector achieving the same degree of success would have had strong assistance over recent decades. There was another thing that I responded to in taking up this project: several years ago there was a major anniversary for Gallipoli. The last handful of old diggers received a lot of media attention; everyone wanted to interview them. I have no argument with that. I just think that there are also many old people who worked long and distinguished careers in the arts, the humanities and the sciences, who are left to die away unacknowledged. It is only one measure of what goes on in Australian intellectual life, but the Nobel count is now up to 11 *, the second most recent being a woman - Elizabeth Blackburn - just to underscore the gravity of this achievement. But yet again we see nothing of this is in a major presentation of Australia to the rest of the world. The 'dumb blonde' survey result pointed the finger at our tourist advertising campaigns. You can add the Shanghai Expo pavilion to that list. One could argue that each of last four centuries was a watershed in science but none was more tumultuous than the twentieth century. We still have among us many whose lives spanned most of it, yet they are passing from us unnoticed. And of course many in fact are still working. They have stories that should be told, should be known to the public. The Study interviews try to redress this situation in a small way. It's about intellectual history. The great philosopher and mathematician A. N. Whitehead once wrote a book titled Adventures of Ideas (Cambridge University Press, 1933) - itself an idea that appeals a lot to me.